Advance your skills from fabric draping and transform your client’s event into a breathtaking magical paradise pulling them through a dreamlike entrance gazebo that will keep guests endlessly captivated with each beach setting. This intermediate level class is geared for people who wish to offer wedding packages in specific destinations. 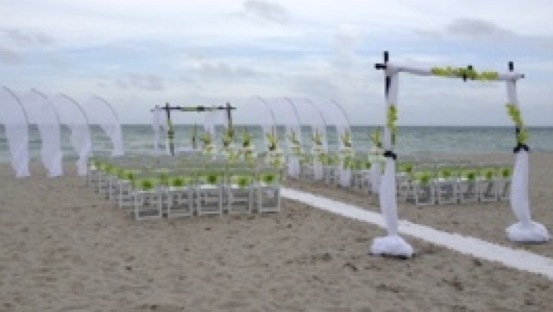 Beach and garden weddings are very unique and customizable. While a destination wedding is a unique alternative to the traditional wedding, it is only successful when planned by an expert. Destination weddings require considerable planning and research. Couples look for someone they can trust and are well trained in the field. In this class you will learn how to construct an alluring threshold that bridges reality and fantasy with various gazebo. From there, you will learn how to personalize and accessorize with additional embellishments to create the most unique and stunning beach designs your clients could imagine. You will increase the possibility of becoming a one-of-a-kind destination wedding expert in your area. Our focus is to help you offer everything your client is looking for in a destination wedding. Professional Destination wedding designers take the stress out of brides planning the perfect wedding, that is why we are here to guide you and help you make incredible setting for unforgettable ceremonies, whether indoors or barefoot on the beach. Join this course and learn how to make amazing beach scenes for those special weddings. If you're looking for a unique way to sell more weddings and help your clients say "I do" consider offering destination weddings. This is an exotic way to get married surrounded by your closest friends and family members. Offering destination weddings allows you to offer stunning designs some that you may even have the opportunity to travel with your bride (free vacation, how cool is that!) Whether you envision yourself having ceremonies on white-sandy beaches, overlooking gorgeous mountain ranges or in a beautiful botanical garden or even at the family's back yard, there are plenty of locations from which to choose. Some may even be near you. The most popular ones are all over the Caribbean and Hawaii. But I’m sure there are many amazing places close to where you live. This course will help you build all-inclusive packages with everything they need for a unique ceremony. This is a highly hands-on class, and we go to a real beach to do set ups. We use chairs, gazebos, arches, flowers and runways for stunning designs.